This week, I'm headed to Georgia to talk about fabric and give a trunk show for the Bulloch Hall Quilt Guild. I was contacted over a year ago by Jan, the program coordinator, and have been looking forward to attending this meeting because I actually know a few of the members through my travels as a fabric strategist. Sample cards of yarn-dyed textured woven from Diamond Textiles. 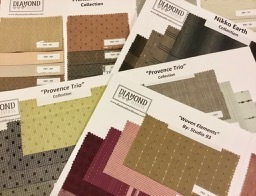 My trunk show will consist of samples—quilt tops and garments—made with several of my fabric lines. I am hoping to get feedback from this group of quilters like I did when giving the presentation for the Madison Station Quilters in Alabama. 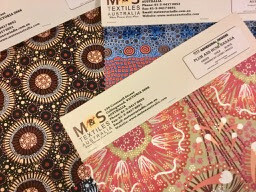 Aboriginal designs from M&S Textiles Australia. My friend Holly Anderson, who is also a certified quilt appraiser, is hosting a small potluck dinner with several of the guild members before the presentation. I am sure the conversation will be lively and it will be fun hanging out with a bunch of quilters. 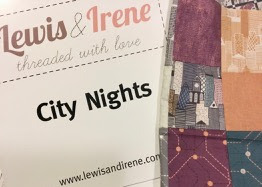 An upcoming fabric collections with metallic from Lewis & Irene. Crazy patchwork with knits? Yes, it's possible!